In 1997 I attended the National Orchestral Institute, a three-week orchestral intensive held annually at the University of Maryland-College Park, and it was during that summer that I met violinist Madeline Adkins. That summer, it became very clear that Madeline was in store for a beautiful musical future: the final concert of that three-week intensive featured Mahler’s Symphony No. 4 and Madeline played the scordatura concertmaster solos in the second movement with the technical assurance and musical maturity found in the performances given by truly seasoned concertmasters and musicians. Since then, Madeline has forged a bright, impressive and inspiring path. In 2000 she joined the Baltimore Symphony as assistant concertmaster and became the orchestra’s associate concertmaster in 2005. In tandem with her duties with the Baltimore Symphony, Madeline became the concertmaster of the Baltimore Chamber Orchestra in 2008, and has appeared as guest concertmaster with orchestras including the Hong Kong Philharmonic, Indianapolis Symphony, Oregon Symphony and Grant Park Symphony Orchestra (Chicago) in addition to having performed as soloist and recitalist throughout the United States, Europe, Asia and Africa. With all of this, Madeline has currently reached another great moment of the stars aligning. In September 2016 she begins a new chapter in her life as the concertmaster of the Utah Symphony, and this comes in tandem with the release of her first commercial CD on South Africa’s TwoPianists label featuring the complete Mendelssohn Violin Sonatas with pianist Luis Magalhães. The 1838 sonata remained unpublished until 1953 (Mendelssohn, in a bout of self-criticism, referred to the sonata as “wretched”), when violinist Yehudi Menuhin revived the work and arranged for its publication. Keenly aware of many of the reactions to Mendelssohn’s music, including criticisms based on the lack of anguish and torture both in his life and his musical output, Ms. Adkins felt that this project was an opportunity to bring more attention to the 1838 sonata as well as the three previously published sonatas in addition to increasing her personal understanding of the composer and his music. “Luis is an incredible musician and a very creative pianist, and this allowed us to improvise dynamics and other aspects during the recording sessions. We DID of course rehearse a lot, but we were able to find the balance of presenting both the best playing – what one could call ‘striving for perfection’ – and a real sense of being in the moment.” The Adkins/Magalhães partnership has expanded to include a recent performance of Nikolay Kapustin’s 2002 Double Concerto for Violin, Piano and Orchestra, Op. 105 with the Staatsorchester Rheinische Philharmonie which they performed in 2014 at the Stellenbosch Festival, and in August the duo embarks on a five-city concert tour across South Africa with a program featuring works by Mendelssohn and Prokofieff. Shortly after finishing her South African tour, Madeline returns to the United States to assume her new position as concertmaster of the Utah Symphony Orchestra. Fully embracing every facet of this transition, Madeline expressed great excitement at joining the Utah Symphony, partially due to the orchestra’s “renaissance” since the appointment of music director Thierry Fischer in 2009. 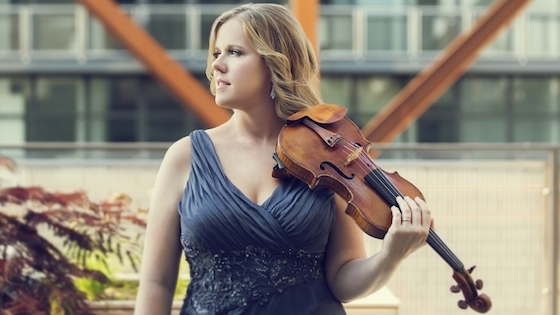 In addition to her duties as concertmaster, Madeline’s first season in Salt Lake City will be one as a full and present member of the city’s musical community as she appears both as soloist with the orchestra in a performance of Prokofieff’s Second Violin Concerto and in recital on the NOVA Chamber Music Series with Utah Symphony pianist Jason Hardink. Fortunately for audiences in Baltimore, Madeline will return during the 2016-17 season for two performances with the Baltimore Chamber Orchestra. For more information on Madeline Adkins, please visit www.madelineadkins.net. For more information on her recording of the complete Mendelssohn Violin Sonatas, please visit www.twopianists.com.